My newest favorite app is Docs Teach. It is an app that allows you to view collections of primary documents. They have many preset activities....but you can also create your own on the website to be used on the iPad! Just a note on primary documents...According to the PARCCOnline site, primary documents are fair game to be used on the PARCC mid-year exam. Students may have to use primary documents to write a narrative piece explaining the event or an informative how to. Below is a picture showing samples of the app in use. 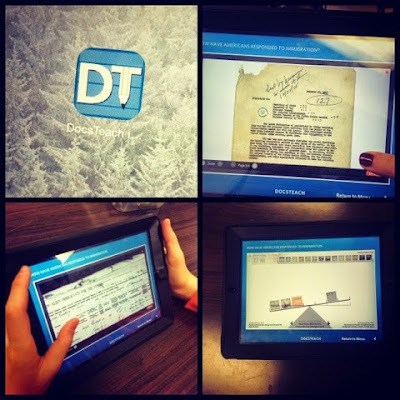 The students choose the assigned content and viewed the documents. They then discussed key text features of the primary documents. We asked them to record a few notes on each document and spend about 2-3 minutes discussing. They then complete an activity. For our class, this happened on the second day of the lesson. The students reviewed their notes and the documents and completed the activity. The one pictured here is for the students to weigh the evidence by placing the documents on a scale according to least or most supportive of immigration. 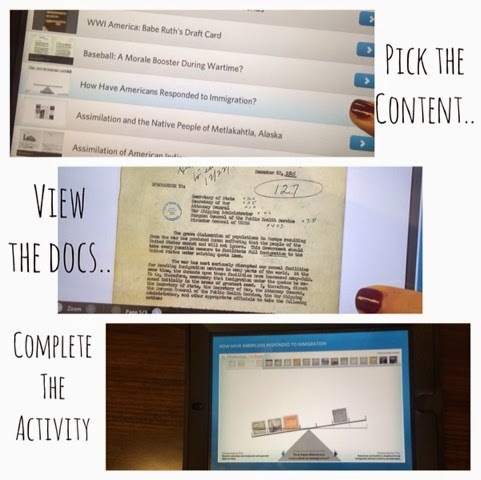 After finishing their activity, the app prompts the student to reflect and submit a reflection to the teacher. Each student typed a short reflection and emailed their answers to us to review.